The customer asked for a stylish blind system to complement his modern living room. 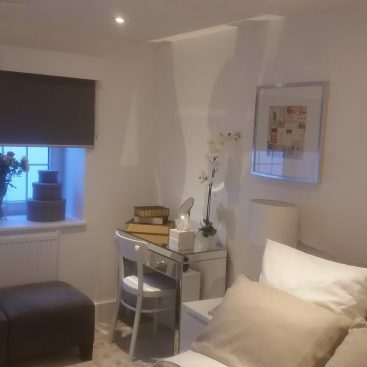 Our team achieved this by installing vision blinds in the room: vision is a stylish fabric that gently filters and softens daylight whilst also offering you the option of a privacy blind. Vision blinds combine the appearance of a roller blind with the full control of light of a venetian blind. The double layer of fabric panels can quickly be aligned to allow more or less light to filter into the room. Available in a variety of styles and colours.